Fans of the little blue engine and his friends visited Drayton Manor Theme Park today for the highly anticipated launch of the £2.5 million expansion to its Thomas Land™ attraction. It was hats off as the Fat Controller officially unveiled the extension to the attraction and the crowds in Sodor were delighted when a host of familiar faces, including Percy, James, Rosie and of course the star of the show, Thomas himself chugged into Knapford Station to join in the celebrations. Europe’s only Thomas Land™ has increased in size by 40% and is now home to a host of exciting new rides as well as the main attraction, Sodor Airport, which is set to be a soaring success. The airport complex includes balconies that offer ‘jet-setters’ unrivalled views over Thomas Land™ and beyond, with the Thomas & Friends themed event rooms, which will be opening in Summer 2015 and it’s very own Sodor Coffee Shop. 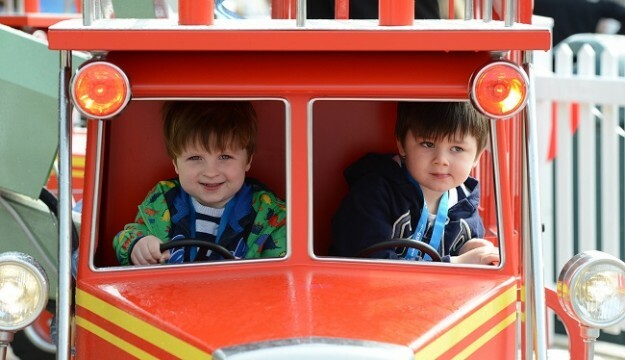 Excited visitors couldn’t wait to climb aboard, fasten their seatbelts and prepare for take-off as they became the first to experience the three brand new rides – Captain’s Sea Adventure, Flynn’s Fire & Rescue and Toby’s Tram Express. Jeremy Jet’s Flying Academy retained its popularity in its new location outside the Sodor Airport complex and Merrick the Crane, a new addition to the Blue Mountain Engines, was also a big hit. The newly improved attraction is now 3,200 square metres bigger, allowing visitors to move around more freely and rider capacity has surged by 23% to a whopping 5,130 people per hour. Thomas Land™ captures all the adventures of Thomas & Friends™ and the magical island of Sodor. 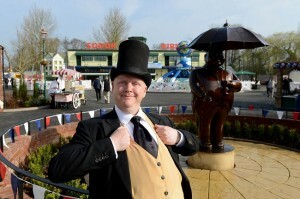 In addition to the new rides and café is an impressive fountain of the Fat Controller and four Victorian fairground games, plus a bandstand for live performances. Colin Bryan, CEO of Drayton Manor Theme Park, said: “Since its launch in 2008, Thomas Land™ has been hugely popular, attracting guests young and young at heart from all over Europe. Drayton Manor Theme Park’s 2015 main season runs every day until Sunday 1st November. Its 65th anniversary Firework Spectacular weekend will take place on the 31st October and 1st November and the established Drayton’s Magical Christmas event on selected dates from 21st November until 31st December 2015. Please note: the park will be closed to the general public on Sunday 13th September and on selected dates in September and October. Please see www.draytonmanor.co.uk for full dates and times.